Sensing some paranormal activity? With this amazing all in one entertainment app now you can actually prove it! 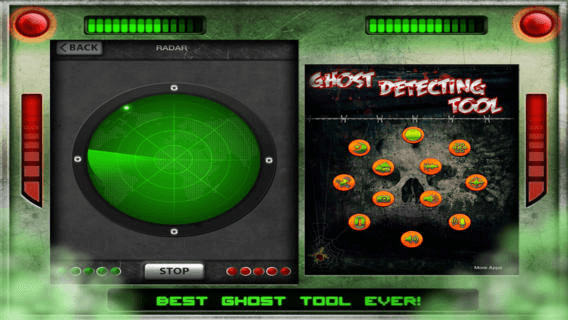 Have you always wanted a tool just like the professionals to sense any paranormal activity around you? This is it! You will not find a more complete paranormal activity sending app out there! RADAR: Based on the energy and noise variations around you, the radar can detect any movement in a 10 meter radio! Just look at the chart screen that gets updated every 15 seconds to see the green circle's location. 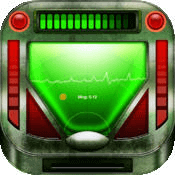 VOICE PHONIC: Based on a voice phonetic pattern detection theorem this app will let you detect activity based on audio! 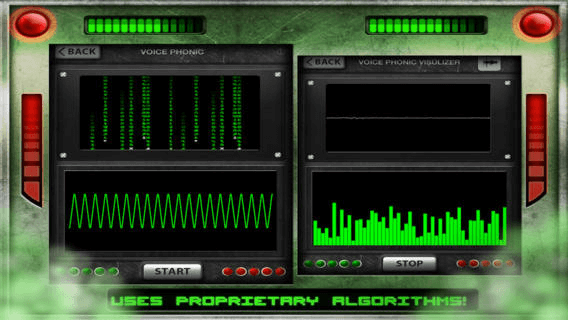 VOICE PHONIC VISUALIZER: This feature will not only locate the sound but also chart it by wave OR rolling form. By extracting the sound from the speaker or microphone it then detects the wave patterns for the sound and charts it for easy reference and visualization. COMPASS: Based on magnetometer and compass data, this amazing app gets you an exact measurement of position. Make sure your device is placed on a flat and horizontal position for the results to be valid. By combining geomagnetic data around your device, the app recreates the best guiding info for best haunting results! 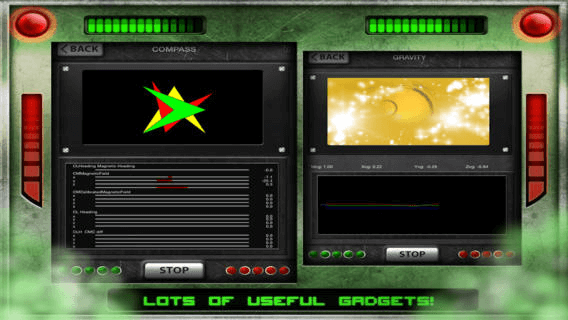 GRAVITY:Using complicated algorithms the spectrum equipment detects user’s device motion to locate it accurately. With this amazing feature the user can know its own sensitivity levels while detecting ghosts. DUSK: Using your devices rear camera this feature will use different filters to locate any activity. GYROSCOPE: Utilizing the device's gyro system it applies a composite theorem to present vibration movement due to ghost. MAGNETOMETER: Check the magnetic energy around you by locating and graphing the energy fluctuation in the environment. These charts can be affected by devices like microwave ovens and the like, so make sure you turn it on when far from these. 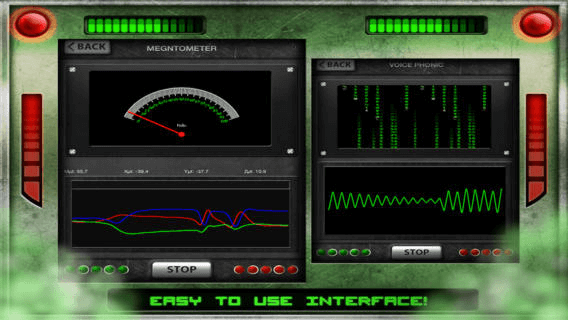 AUDIO AMPLITUDE:This feature uses the device's sensing system of hearing to evaluate composite sound signals. It is able to catch deeply low sound signals which are not hearable for any person. This app is intended for entertainment purposes only and does not provide true ghost detecting capabilities. 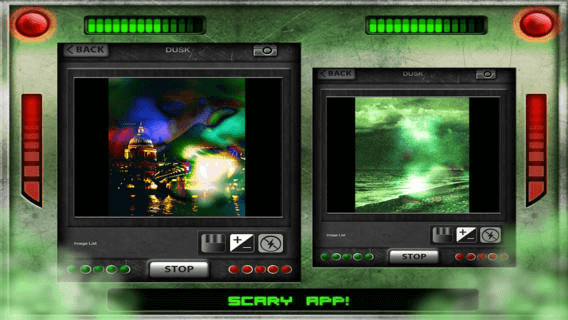 THIS APPLICATION WAS DEVELOPED TO HELP INVESTIGATE THE POSSIBLE PARANORMAL ACTIVITY. HOWEVER, THE APPLICATION CANNOT REALLY PROVE THE EXISTENCE OF ANY PARANORMAL CREATURES OR ENTITIES. THE APPLICATION WAS DEVELOPED AND IS INTENDED FOR ENTERTAINMENT PURPOSES ONLY. WE CANNOT BE HELD RESPONSIBLE FOR THE USE, MISUSE OR ANY INTERPRETATIONS THAT MAY COME FROM IT. Always wanted to prove the existence of paranormal activity around you? Now you can with this all inclusive entertainment app with all of its amazing features!